Central composting toilet system sold SEPARATELY. The dry toilet is for use with Centrex waterless central systems. It is important to note that when you purchase this dry toilet, all you are getting is the toilet fixture to be installed in the bathroom. The central composting system that handles the waste is sold separately. The dry toilet is completely waterless, making it an ideal solution for homes without running water connections, or for those who have very limited water and must conserve what they do have. 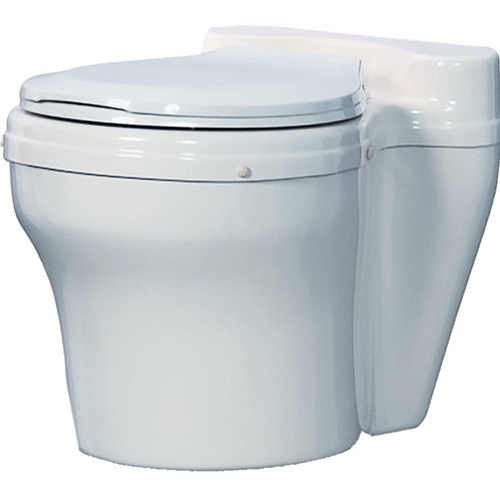 Available in white or bone colors, the dry toilet has a 15" seat height and features a regular sized toilet seat. Please note, only one dry toilet can be installed on a Centrex waterless central system. This is because the toilet must be installed directly above the central composting unit below. 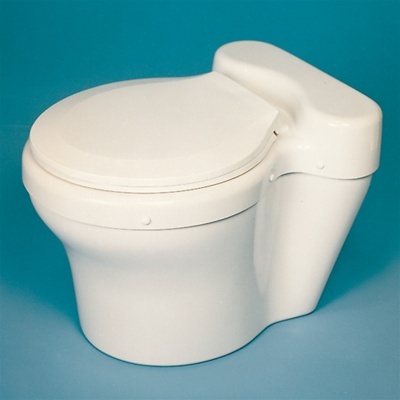 Dry toilets include a bowl liner that fits beneath the seat and can be removed for cleaning, as required. The toilet is connected by a straight 10" diameter pipe piece to the Centrex waterless composting unit (sold separately) directly beneath the toilet. Bolt the dry toilet to the floor immediately above the waste inlet of the Centrex waterless central composting unit (sold separately). The toilet chute extends 4" below the toilet base so that it can sleeve into the 45" long waste pipe piece, or directly into the waste inlet transition piece. The 45" long 10" diameter pipe piece supplied can be cut to size, so the toilet mounting surface can be anywhere from 36-1/2" to 81-1/2" above the surface the central composting unit is placed on. A second toilet is not possible when using a dry toilet. For more information on waterless systems or installing dry toilets, please see Installation Considerations. Please note, there is a 20% restocking fee on all returns of this item. For complete details, please see our store Return Policy page.